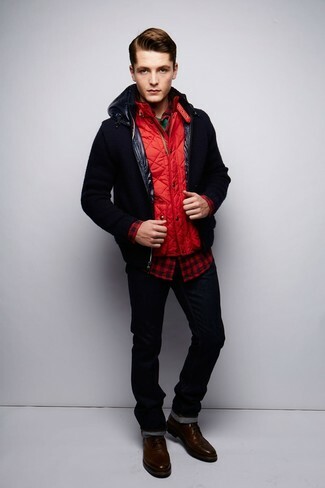 If you're hunting for a casual yet sharp outfit, reach for a red quilted gilet and charcoal chinos. Both pieces are totally comfortable and will look great together. Smarten up your outfit with black leather casual boots. 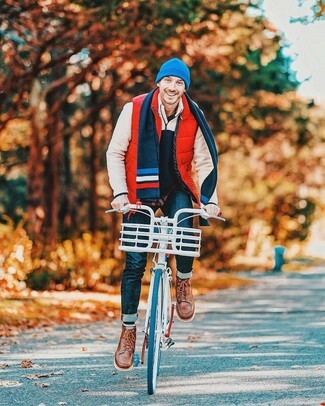 If you're hunting for a casual yet seriously stylish ensemble, go for a Thom Browne 4 bar quilted down vest from Nordstrom and beige chinos. Both items are totally comfortable and will look great paired together. If you're in search of a casual yet sharp ensemble, consider pairing a Thom Browne 4 bar quilted down vest from Nordstrom with blue jeans. Both pieces are totally comfortable and will look great paired together. Channel your inner Ryan Gosling and go for a pair of tan suede derby shoes to class up your ensemble. 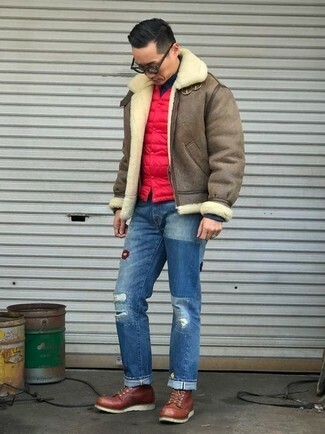 Consider wearing a Thom Browne 4 bar quilted down vest and blue ripped jeans, if you want to dress for comfort without looking like you don't care. Go for a pair of brown leather work boots for a more relaxed aesthetic. 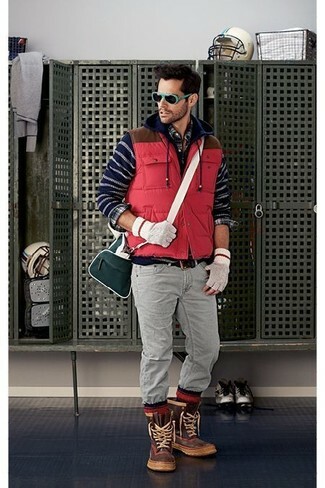 If you're scouting for a casual yet sharp outfit, make a red quilted gilet and grey jeans your outfit choice. Both pieces are totally comfortable and will look great paired together. Rock a pair of brown snow boots to make the ensemble current. Consider wearing a Thom Browne 4 bar quilted down vest and blue skinny jeans to be both cool and relaxed. Want to go easy on the shoe front? Grab a pair of dark brown leather work boots for the day. 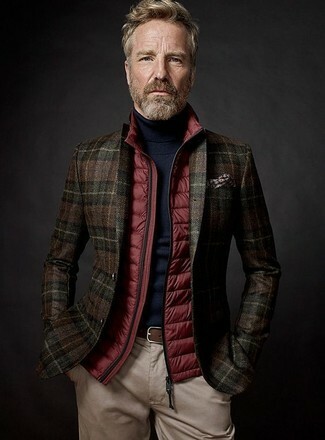 If you're searching for a casual yet stylish outfit, pair a Thom Browne 4 bar quilted down vest with brown chinos. Both items are totally comfortable and will look great paired together. Got bored with this ensemble? Enter dark brown leather casual boots to switch things up. 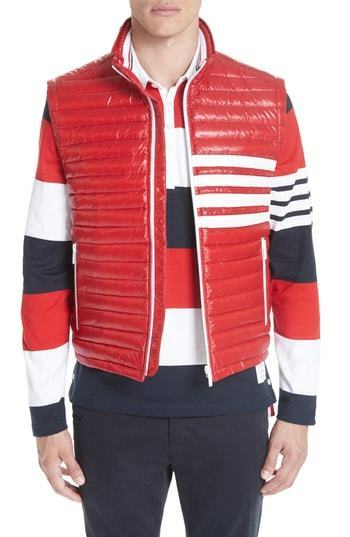 Rock a red quilted gilet with black jeans to show you've got serious styling prowess. Up the cool of your getup by complementing it with dark brown leather casual boots. For a laid-back look, consider pairing a Thom Browne 4 Bar Quilted Down Vest with navy jeans — these two pieces work really well together. If you want to easily dial down this look with a pair of shoes, why not complete your look with a pair of brown leather work boots?